I have always appreciated the e-mail that I received from Peggy Burge in 2001, and I hope Peggy won't mind my sharing it below. Peggy's genealogical information is quite complex, but there are some interesting facts that emerge. The main fact is that we are just distant cousins by marriage. 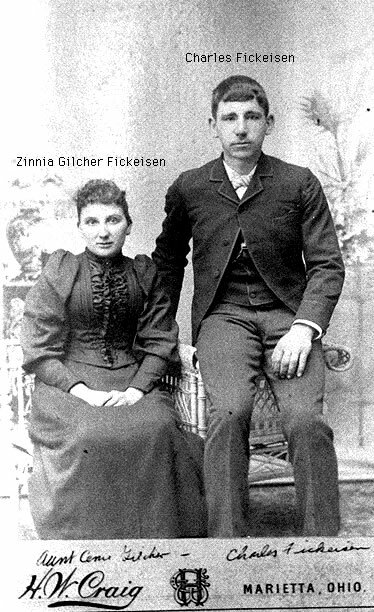 In a phrase, my great grandmother's brother Charlie Fickeisen married the sister, Rosena Glicher, of Peggy's grandfather, Henry Gilcher. But, this distant relationship is not to be sneezed at! For one thing, my mother is in possession of a picture of Peggy's grand aunt Rosena together with husband, Charlie. And we know quite a bit about Charlie, that he played in the Cow Run Band, that he had four children. Some of the stories that mom has told are not all that complementary of the relationship between Charlie Fickeisen and his sister, my grandmother, Eva Fickeisen Noe. Perhaps the most significant contribution of the Johann Fredrich William Gilcher (1802-1873) descendant chart below is that it forms an important part of the history of the German Community out on Pleasant Ridge in Washington Co., Ohio. There are many listings of various spellings of Gilcher from the Rhineland-Pfalz area in the International Genealogical Index. It is also clear that there is a complex intertwining of the names Gilcher, Fickeisen, Noe, Zimmer, and several others. Hi Jim, This is some of the information I have on the Gilcher family line. I am the daughter of Carl Russell (wife Dorothy Geiling Batteiger) , son of Henry (wife Josephine Dugan and Ivy Alloway) , son of Frederick (wife Caroline Zimmer), son of Johann Frederick W.
Jacob (wife Julia) was also the son of Frederick (wife Caroline). I have copies of his pension files which included a copy of the family's emigration papers from Kusel. I have little detail other than dates and places. Almost no pictures or facts but would love to have copies of anything that you do have. Maria Renner was the wife of Johann Zimmer the father of Caroline Zimmer who married Frederick. I look forward to hearing from you.